The Boundary Waters Canoe Area Wilderness is America’s premier canoe destination. It is also one of the most accessible wilderness areas in the United States and where Wilderness Inquiry began operating in the 1970’s. Over one million acres in size, the Boundary Waters covers much of the Superior National Forest in northeastern Minnesota. Paddle among towering pines in this home to moose, lynx, wolves, and bald eagles. Every trip has two WI guides to ensure your adventure is the best it can be. These fabulous guides combined with excellent food, gear and decades of experience make Wilderness Inquiry BWCA trips an exceptional value. Our classic 5-day Boundary Waters Canoe Area Paddle Adventure is the quintessential canoe trip. Paddle lightweight Wenonah kevlar canoes and camp in beautiful lakeside campsites. The Boundary Waters lodge based adventure is based out of beautiful Wintergreen Lodge on White Iron Lake. From here, you’ll enjoy excellent BWCA day trips off the Kawishiwi River or the Fernberg Trail, returning to delicious meals, a glass of wine, and a comfortable bed at night. 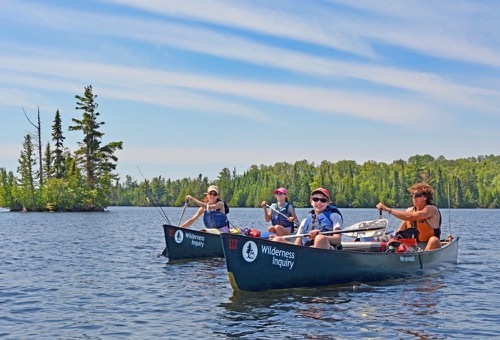 The Boundary Waters Family Canoe and Hike trip is geared for families and based at a Forest Service campsite, allowing us to do day trips in smaller groups into the Wilderness. Our Boundary Waters Winter Adventure changes it up for winter fun at Camp Menogyn on West Bearskin Lake. 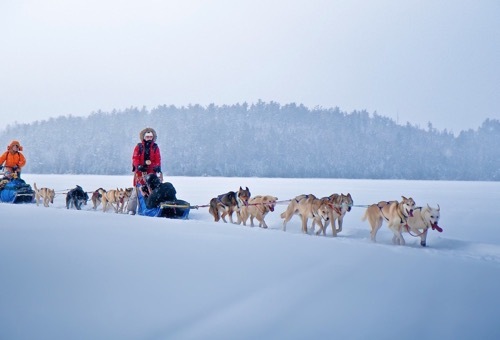 You will love dogsledding, skiing, and seeing the Wilderness dressed in its winter clothes. Whatever Boundary Waters trip you choose you will enjoy this iconic Wilderness area and come to understand why it is beloved by so many. The Boundary Waters Canoe Area Wilderness (BWCAW, or simply BWCA) is our nation’s only large lakeland wilderness, where travel during the ice-free months is primarily via canoe. At over 1 million acres, the area remains the largest wilderness east of the Rockies and north of Florida’s Everglades, and the storied Boundary Waters remains the most popular wilderness in the nation. The reasons for its popularity are clear to anyone privileged enough to experience its beauty firsthand. Crystal clear water, majestic white pines, moose, loons, beavers, and abundant fish make the BWCA the gem of the North. In 1964, Congress designated the BWCA as one of the first federally protected wilderness areas in the United States as part of the National Wilderness Preservation System. The BWCA, the northern third of Superior National Forest, lies on the international border between northern Minnesota and the Province of Ontario, Canada. Together with the adjoining 1.2 million-acre Quetico Provincial Park on the Ontario side of the border, this international wilderness complex forms an unparalleled lakeland wilderness complex of 2.3 million acres, an area larger than Yellowstone. Sculpted by glaciation, the area is part of the Canadian Shield, a geological formation that comprises portions of the earth’s most ancient exposed rock, some of which is 3 billion years old! The Boundary Waters contains about 1,175 lakes in all, making a maze of interconnected wilderness waterways to explore. 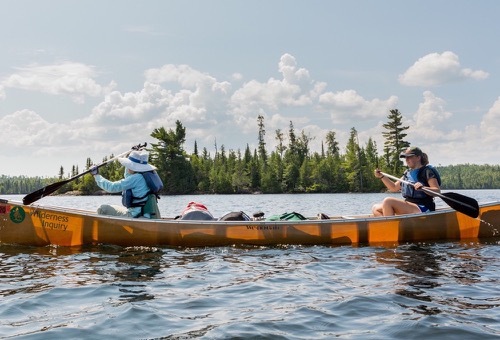 Whether you paddle one of the larger border lakes — Saganaga, Knife, Basswood, Crooked, Lac La Croix — or one of the smaller more intimate lakes, you’ll experience an undeveloped lakeland wilderness that appears much the same as it has for hundreds of years. Each lake brings its own distinct personality and you may find you and your canoeing partners each have a different favorite. Two types of forests, the Boreal and Laurentian forests, converge to create a unique ecosystem with diversified plant and animal life in the Boundary Waters. Animals that would not normally be seen together, such as the white-tailed deer and the moose, have made the BWCA their homes. Many birds, such as bald eagles, loons and over 20 species of wood warblers, use the Boundary Waters as their nesting grounds. Anglers can test their skills against the area’s lake trout, walleye, northern pike, or smallmouth and largemouth bass. Humans have left their mark on the Boundary Waters as well. Native peoples inhabited the Boundary Waters area for thousands of years, with some human relics dating back to 10,000 BC. The Anishinabe (sometimes called Ojibwe, or Chippewa) and Dakota (Sioux) used the intricate waterways of the BWCA for hundreds of years. Native peoples first used many of the campsites and portages (paths between lakes) still used today. Artifacts from that period still turn up. European fur traders and missionaries first came into the area in the early 1700s. A working relationship developed between the European fur traders and the Ojibwe, based on trade of European goods for native knowledge and furs. This partnership ended in the mid 19th century due to the declining interest in furs as fashion. Fur trading and logging of the Boundary Waters began taking its toll on the fragile ecosystem. People decided to act, setting aside this pristine wilderness area and working to protect it from further harm. In 1909, President Teddy Roosevelt established the Superior National Forest, with 1,000 square miles of roadless land (the precursor to the BWCA) later set aside in 1926 as the nation’s second administratively-established wilderness. The 1964 Wilderness Act designated the Boundary Waters as an original unit of the National Wilderness Preservation System, but with some compromises that allowed logging and motorboats to continue there. Congress passed additional protections for the BWCA in 1978, and expanded the area to its current borders and size of 1.1 million acres. 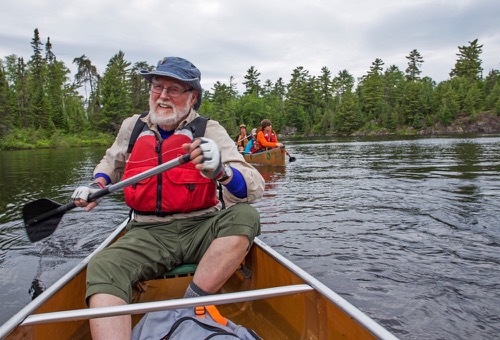 The controversy surrounding this Congressional effort for the Boundary Waters also led to the establishment of Wilderness Inquiry; WI began by taking canoe trips in the BWCA and continues doing so to this day.